Blau syndrome (BS) is a monogenic granulomatous polyarthritis associated with rather severe uveitis resulting from mutations at or near the nucleotide-binding oligomerization domain (NOD) domain of NOD2. It encompasses early-onset sarcoidosis (EOS), a form of granulomatous arthritis affecting children before the age of 5 years and known since the mid-1970s, and a familial form described separately by Blau and Jabs in 1985. Once the mutation was identified it was clear that BS and EOS were the same disease and both are now covered under the eponym Blau syndrome. This chapter covers the spectrum of clinical manifestations of and diagnostic strategies for the investigation of patients with Blau syndrome, provides an update on pathogenesis and highlights several management recommendations. These developed as knowledge of the natural history improved with the creation of multicenter cross-sectional studies and an ongoing multicenter cohort study. 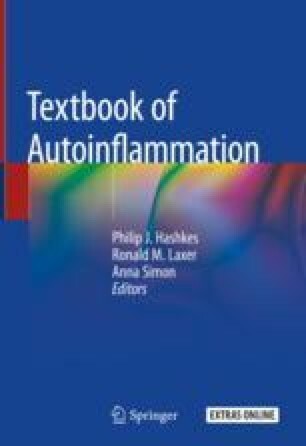 Infevers: an online database for autoinflammatory mutations. http://fmf.igh.cnrs.fr/ISSAID/infevers/. Last updated 10/29/2014. Accessed 1 May 2017.